Having a pool fence installed in your Columbia, Illinois yard is a great way to keep your little ones and pesky critters from entering the pool area. But how do you know which company to trust with the installation? Cedar fencing – Our Western Red Cedar fencing is installed using 2 x 4 rails to increase the durability of the fence, and it resists warping and cracking far better than treated lumber, increasing the longevity of your fence. Aluminum fencing – Homeowners who choose our aluminum fencing for their new fence will benefit from a fence that will not flake, has no visible rivet or screws, and has pickets that can be installed two inches apart rather than the traditional four inches. Vinyl fencing – Our vinyl fencing is one of the most resilient fencing options on the market as well as one of the easiest to maintain, requiring just a simple cleaning. This fencing will not fade or become discolored, and its poles are set 44 inches deeper than most other vinyl fencing for increased durability. Additionally, all of our fencing is installed by our own employees, not subcontractors, so you can rest assured that your new pool fence will be installed according to our exacting standards and the manufacturers’ specifications. 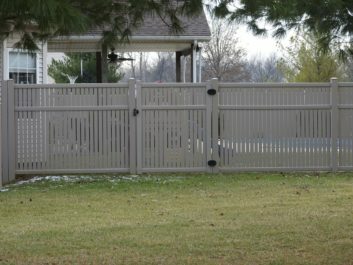 For more information on the pool fence options available to homeowners in Columbia, IL contact Chesley Fence & Deck today. We just wanted to say thank you for the awesome job on our fence!